Even if you focus on just those last three bullet points, 2012 still reigns supreme: When the three largest players in Silicon Valley all release major locally-oriented products within three months of each other, you know the space is heating up. Going out on a limb here, I predict that the local temperature will only continue to rise in 2013. 2013 will not, I think, be a year of radical changes in the local search paradigm. Rather, it’s going to be a year in which existing technologies and platforms mature and the potential of some thus far disconnected features at Google and Facebook begins to be realized. I don’t think we’ll see social factors on Google+ (things like number of Circles that include a business, number of interactions on a business page, number of shares of a business page, etc.) play much of a role in local search -- at least for the first half of the year. These kinds of signals may pick up in importance gradually toward the end of the year, but I’m predicting that the watershed year for Google+, at least in local search, will actually be 2014. My sense is that the infrastructure that underlies Google’s local dataset is still too shaky to start layering on heavy algorithmic criteria. I do, however, think we’ll start to see the fruits of Google’s Hotpot initiative borne in a much bigger way this year, though, around personalized local business recommendations for consumers. Even if Google+ users are not particularly active, Google is gathering lots of data about the types of businesses users are clicking on in search results -- and presumably starting to build up personas and cohorts around users who click on similar business listings and web results. This is especially true for those Google+ users who leave a lot of structured Zagat reviews. And anyone who attended my Distilled SearchLove presentations in London or Boston knows that I think these active Google+ users (in other words "Power Reviewers") are going to hold increasing sway over a much broader range of results than just the ones their friends see. Although I already predicted a much more robust dashboard earlier in 2012 (see what I meant before when I talked about the folly of these kinds of predictions? ), you don’t have to be an expert to see the writing on the wall for this thing. In some sense, Facebook has forced Google’s timetable a bit with its launch of Nearby. Facebook's business community was already much more engaged relative to Google+’s. That fact combined with Facebook’s existing Insights and page management features -- and some of its newer, dead-simple ad units -- may put Google in an unfamiliar local position (behind someone), unless some of this functionality is rolled out in Q1 or Q2 of 2013. When you start seeing coverage of Apple Maps and Google Maps’ iOS App on your local 5:00 news, you know local has finally gone mainstream -- via smartphone. But what does local on mobile really look like? I’m not sure we have a clear picture yet. A Neustar Localeze/15 Miles/comScore study almost a year ago implied that 50% of local searches on mobile devices might be happening in-app -- meaning the percentage of local searches on mobile devices might be even higher than the 50% number that is traditionally reported. I was among the skeptics of Steve Jobs’ 2010 statement about the mechanics of mobile search, but as with so many other predictions, he appears to be right. I think we’ll continue to see an increase in the percentage of local searches conducted on smartphones -- far beyond the traditional numbers that comScore or Nielsen report. While I’m no expert on the terms and conditions of the App Store, the instant popularity of Google’s native iOS Maps app also leads me to predict that some sort of in-app advertising will be the next revenue frontier in Google’s ever-expanding AdWords inventory. Google’s introduction and improvements to its Mapmaker tool have helped marketers clean up a number of data issues this year, but the proliferation of non-Google location-aware and location-dependent apps is only going to continue in 2013 -- meaning spreading location data for businesses far and wide, and monitoring the consistency of that data, will continue to be critical in 2013, as Mike Ramsey predicted a couple of weeks ago. At Google in particular, we’ve already seen a dramatic decrease in the number of categories that appear on a typical +Local page (from 5 to 1 or 2), which can only mean Google will attempt to pull category information from a broader array of sources than just business owners themselves. Schema.org will help with that, and I expect to see more specific categories added to this list for savvier webmasters to implement. That’s going to leave a lot of small business owners out of luck, however, meaning structured category information from major data providers had better be accurate and complete. The biggest “disruption” I see coming in local this year is around mobile payments. This is going to be good news for merchants small and large alike, as payments via smartphone will make it much easier to close the research-online-buy-offline loop and calculate an actual ROI on specific marketing spends. Square is going just gangbusters this year, reporting over $6 billion in sales from over 2 million merchants as early as June. I predict that will grow to $15 billion from close to 3 million merchants by the end of 2013. The American Express-Foursquare deal is just another signal that big money is betting heavily on this phenomenon. Google Wallet is going to have plenty to say about the innovation in this space as well. I see more transactions happening directly on +Local pages in many, many verticals beyond hotels and restaurants by the end of the year. By December 2013, I expect to see the ability to book appointments with service merchants like hair salons and dentists as a feature of Google+ -- either through a third party (like OpenTable for restaurants) or directly through Google (like its Hotel Finder). As I said way back in August, I think Foursquare is ripe to be purchased by someone. Whether that is Apple, Google, or Facebook remains to be seen, but to my mind Apple needs Foursquare VENUE data desperately, it may be a better cultural fit for Foursquare’s existing user base, and it could help lead to much wider adoption of Passbook by both merchants and smartphone users. Google, meanwhile, needs activity on and around Google+, and while there would no doubt be some attrition among the more indie Foursquare crowd, historical check-in information could be extremely valuable as Google builds out its platform. If Apple doesn't end up buying Foursquare, I would not be surprised to see them purchase a major data aggregator, rather than go through 3-4 years of pain and suffering to build our their own version of Google’s Local Business Center/Places Dashboard. As I said at the very top of this article, these predictions will likely make me look foolish on January 1, 2014. But whatever this year holds, I know one thing: At least for me, local search will continue to be the most dynamic, fast-paced, and thrilling areas of search marketing to be involved in. 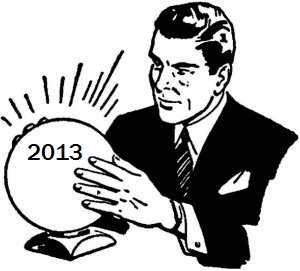 What local search predictions do you have for 2013? This is a guest post written by David Mihm, director of local search strategy at SEOmoz. He has created and promoted search-friendly websites for clients of all sizes -- but especially local small businesses -- since the early 2000’s. David co-founded GetListed.org, which he sold to SEOmoz in November 2012. David writes frequently about local search on the SEOmoz blog.